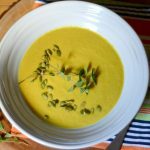 This recipe for curried carrot soup is one of our family favorites. Warm, comforting and delicious–we make it on the regular. In a saucepan, saute onions and garlic in the olive oil. Add spices and saute until fragrant. Add carrots, coconut milk, and vegetable broth. Simmer for 35 minutes or until the carrots are soft. Using an immersion blender (or a regular blender), process until smooth. Serve with a drizzle of coconut milk, sliced almonds, spiced pumpkin seeds, crisped bacon pieces or crumbled sausage.